From our Facebook fans: What is the name of the local lunch you recommended between Murren and Wengen; baked egg over cheese, over a slice of bread? Great question. It’s called Käseschnitte, and it’s a popular dish of the Valais and Bernese Oberland regions of Switzerland. French speakers call it croûte au fromage. We’ve often said that Käseschnitte is to toasted bread and cheese what filet mignon is to steak, a divine upgrade. The dish comes in many varieties, but the basic version is nothing more than toasted bread covered with locally available cheese and white wine. The whole thing is broiled and often served with a slice of ham, tomato or both beneath the cheese. The Swiss like to eat Käseschnitte with a fried egg on top, adding cholesterol insult to injury. To order a Käseschnitte straight up, without egg, ask for it “ohne ei” (oh-nah eye). Käseschnitte is a very warming dish during the winter and a great hiker’s repast during summer. 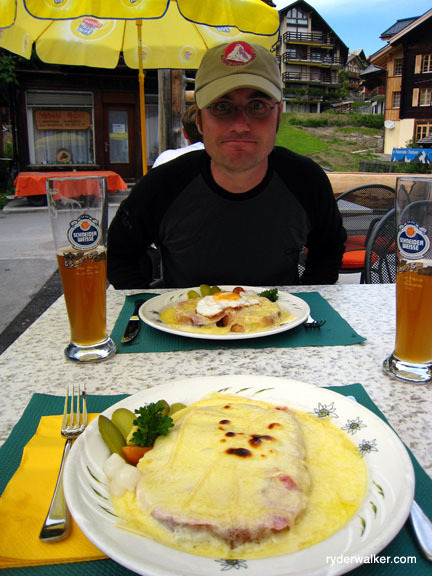 Incidentally, our secret lunch spot between Murren and Wengen serves up some of the best Käseschnitte found anywhere in the Alps. Here’s an easy recipe to make your own Käseschnitte. 4 slices of french bread, ½ “ thick, cut from a boule or large batard. 4 Tablespoons of clarified butter. ¼ cup dry white wine (more if you’ve had a long day). 8 slices of cheese, emmentaler, raclette, or fontal for traditional flavor. Paprika, pepper, or seasoning of your choice. Optional garnish: Gherkins and pickled onions. Put 2 tablespoons of the clarified butter in a frying pan and toast the bread on both sides. Place 2 slices of the toasted bread in a baking or casserole dish and sprinkle liberally with the white wine. Place a slice of cheese on each slice of bread, add a slice of ham, and top with the remaining cheese. Bake the whole thing in the oven until the cheese is melted and slightly browned. Place a fried egg on each portion and season with a dash of paprika (for traditional flavor), pepper, or the seasoning of your choice. Serve with a garnish of gherkins, pickled onions and a glass of white wine from Switzerland. Your Käseschnitte is ready! Bon App!